After traveling to Vienna and Bratislava, we spent 3 days in Budapest, and to be honest, we can’t wait to go back. Three days in Budapest was just too short to see, eat, and drink everything we wanted, so now we basically made up a lame excuse to spend another 3 days in Budapest. LOL. 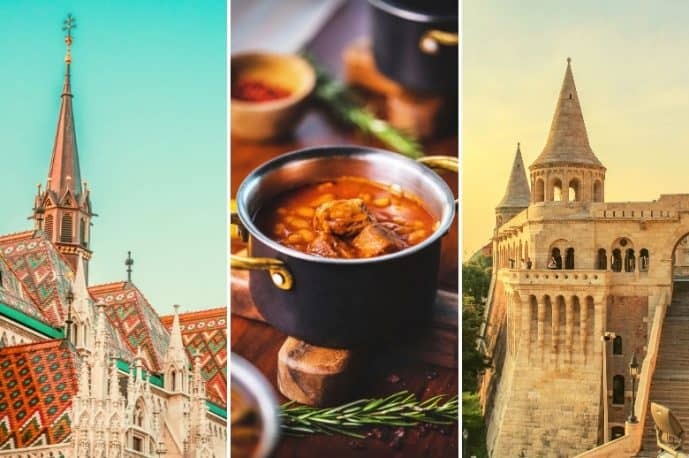 Anyway, our visit was so fantastic we want to show you how to have the same experiences when you plan your Budapest itinerary. Note that we won’t put specific time suggestions for each stop on your trip. It’s totally up to you how much or little time you’ll spend in each place during your 3 days in Budapest. Tailor this itinerary to your wishes. If you come from Paris to Budapest, you think you’re in Moscow. But if you go from Moscow to Budapest, you think you’re in Paris. Looking for things to add to your Budapest 3 day itinerary? Read on! Hey, looking for more posts about Hungary? 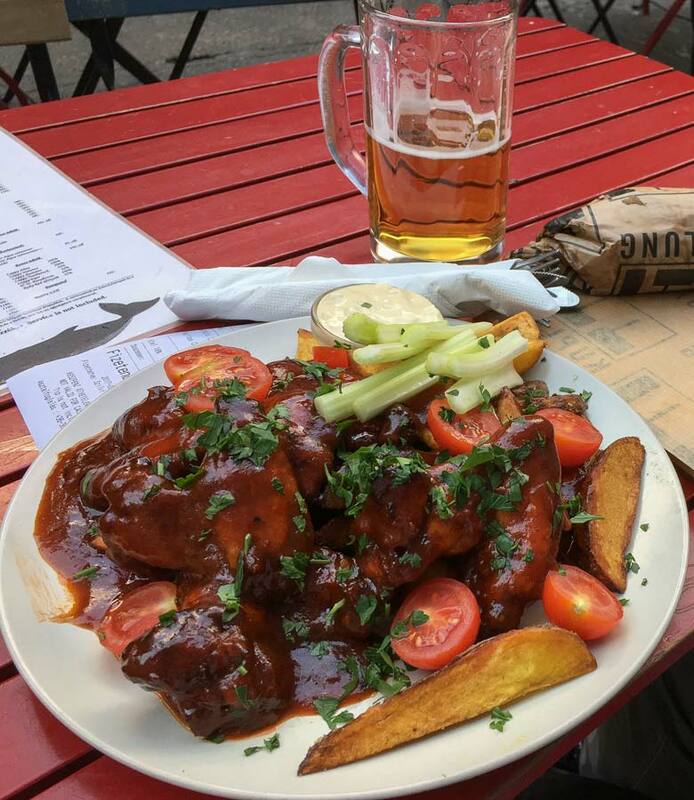 Check out the link below, or take a look at all our Hungary posts. Many people traveling to Budapest ask us how many days they should spend in the Hungarian capital. Well, you can easily stay a week, to be honest, but we, normal humans, don’t have that many vacation days, so three days will do. 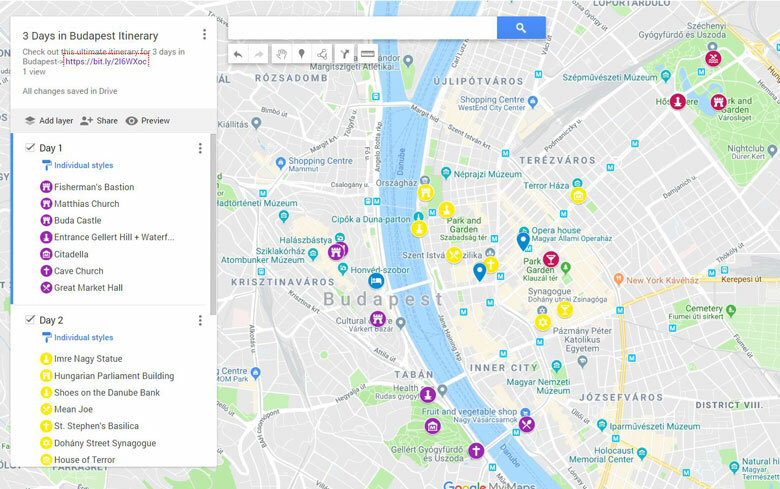 If you only have 2 days in Budapest, it’s not exactly rocket science, pick the most important places to visit of each day and try to group them by region. – Carlton Hotel Budapest – On the Buda side of the city. Quiet area and comfortable hotel near Buda Castle and Fisherman’s Bastion (perfect if you, like us, want to get early to take good shots of it). – Callas House – On the Pest side, traditional building near most ruin pubs and St Stephen’s Basilica. Ideal for those who want to enjoy the local nightlife. – Hotel SasOne – On the Pest side, near the Deak Square (“Budapest Eye”) as well as many restaurants and bars, but not a noisy place. Ideal for solo travelers, but also for couples. Click here to access the interactive map in Google Maps. 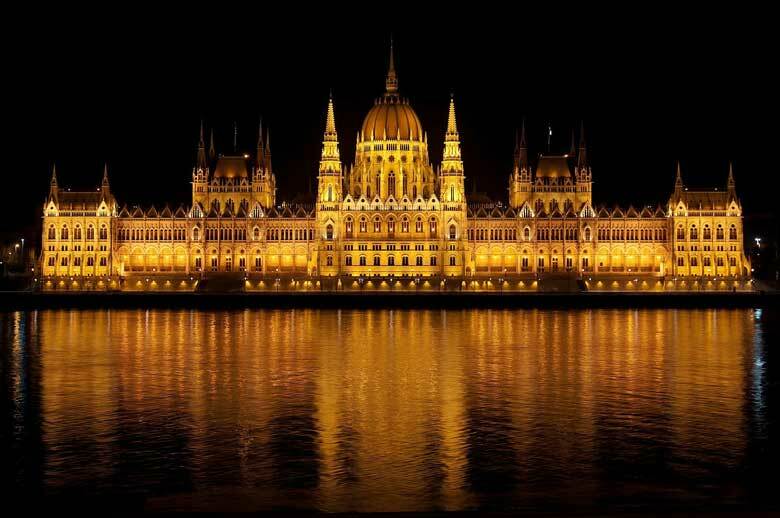 Budapest was once three cities: Buda, Pest, and Óbuda, which were divided by the Danube River. When the Turks took Buda and Pest in the 16th century, they built good bath-houses and transformed churches in mosques. A century later, Buda, Pest, and Óbuda were conquered by the House of Habsburg from Austria, and later on, Pest became the political and intellectual center in Hungary. The intriguing Chain Bridge was opened in the 19th century to bring the cities together. 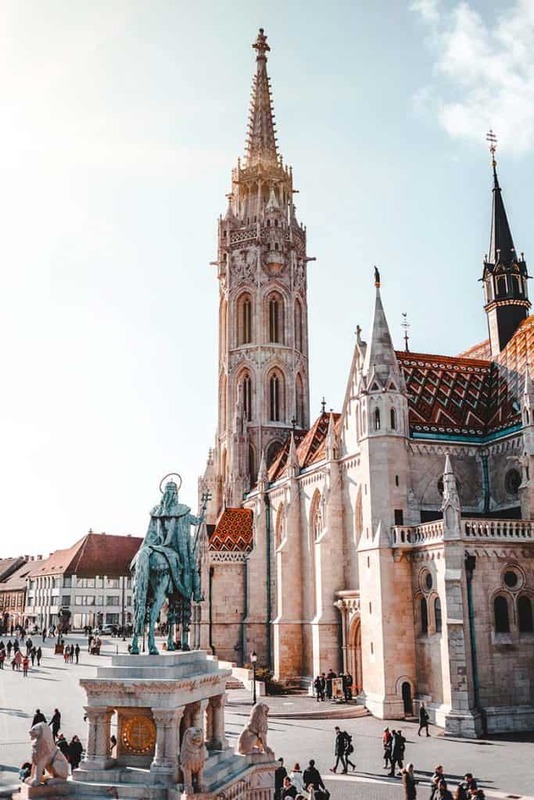 That is also when the Austro-Hungarian dynasty arose: Emperor Franz Joseph I and Empress Elisabeth, commonly known as Sissi (yes, the controversial Sissi), were crowned in Matthias Church at the Fisherman’s Bastion. But the century wasn’t done yet: the three cities have finally became one, Budapest. Due to the WWI, Budapest’s economic situation had drastically deteriorated, and after WWII, the city was severely wounded. After that, rigorous Soviet forces controlled Budapest leading to the Hungarian Revolution of 1956, which was brutally crushed by law enforcement. The city was desolated, and even today you can see the consequences of it (many bullet holes are to be seen throughout the city’s constructions). In the 1960s and 1970s, the reconstruction of Budapest finally took place and even in the 1980s the city still felt the pain of 30 years earlier. In 1989, they paid tribute to Imre Nagy in the Heroes’ Square, the prime minister who was executed during the Hungarian Revolution of 1956. These political changes led to the Iron Curtain on the Austro-Hungarian border to be pulled down. Day 1: Fisherman’s Bastion, Matthias’ Church, Buda Castle, Gellért Hill, Great Market Hall, and Váci street. Day 2: Imre Nagy Statue, Hungarian Parliament, Shoes on the Danube Bank, St Stephen’s Basilica, Dohany Street Synagogue, House of Terror, and ruin pubs in the Jewish Quarter. Day 3: Heroes’ Square, Vajdahunyad Castle, Széchenyi Thermal Bath, and Kuplung Ruin Pub. The climate is humid continental in Budapest, which means that summers are warm to hot and winters can be severe too. So the best time to spend 3 days in Budapest would be from March through June and from late September through November. 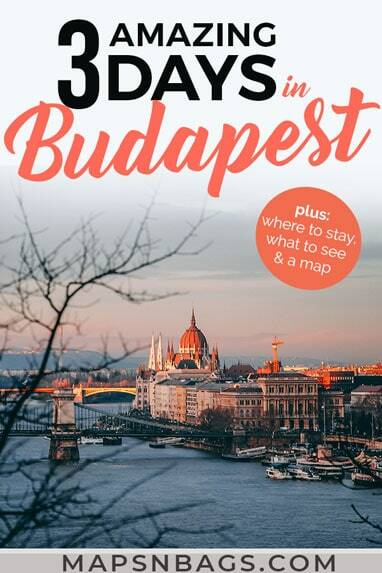 You’ll probably begin your 3 days in Budapest by flying into Budapest Airport if you’re coming from far away, or into the Keleti railway station if you’re coming from nearby countries. We arrived at the railway station because, as mentioned, we came from Bratislava and this was the easiest (and cheapest) route. To get from the airport to the city center, take the 200E bus (line 900 during the night) towards Kőbánya-Kispest station, and then the subway until the closest station to your hotel. It’s very easy to get around the city by public transport, and the whole trip costs around HUF 700. Alternatively, you can take the 100E bus direct to Deák tér station (center), except between 11 pm and 4 am. The ticket for this bus is slightly more expensive than the other, HUF 900. Overall getting around Budapest by public transport is pretty easy and cheap, for more info check our guide on Budapest public transport. Avoid hailing taxis off the street, there’s a big chance you’ll be scammed. If you need transportation during the night, use Uber instead, click here to get $5 off your first ride. Okay, done with history for now. Like I said above, Budapest is divided by the Danube River and we explored, for obvious reasons, one side and then another. Let’s start our 3 days in Budapest itinerary on the Buda side. 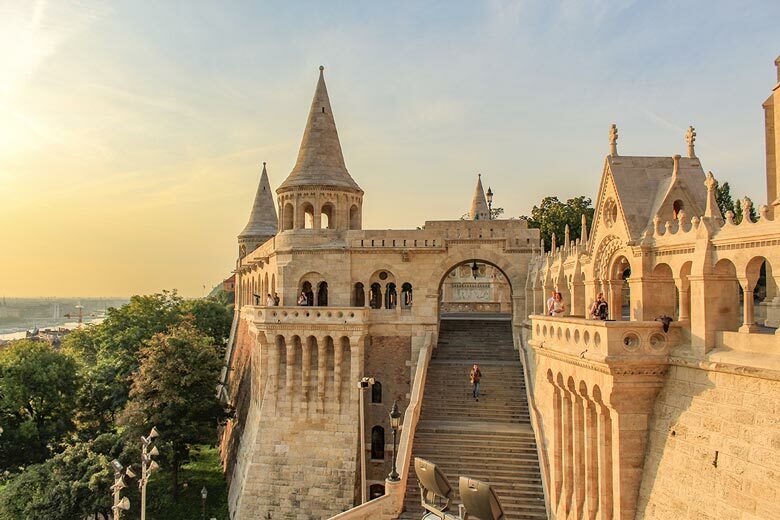 A fairytale little castle, the Fisherman’s Bastion is a ridiculously pretty place, and you shouldn’t miss it. The bastion has seven towers, one to each of the seven tribes that founded the city. It reminds me of Disney’s logo, don’t you agree? Anyway, the balconies are free of charge, but if you want to visit the upper towers, they charge a small fee (HUF 1000). Stop by their cafe in the balcony and enjoy a cup of coffee with a view: the parliament building on the other side of the Danube River. Pro tip: Early birds, it pays off big time to arrive early at the Fisherman’s Bastion. As beautiful as it is, it gets jam-packed with tourists during the day, taking the charm our of it. However, we arrive around 7 am here, and besides two couples who were taking outdoor wedding photos, we were the only ones at the place. Totally worth it. 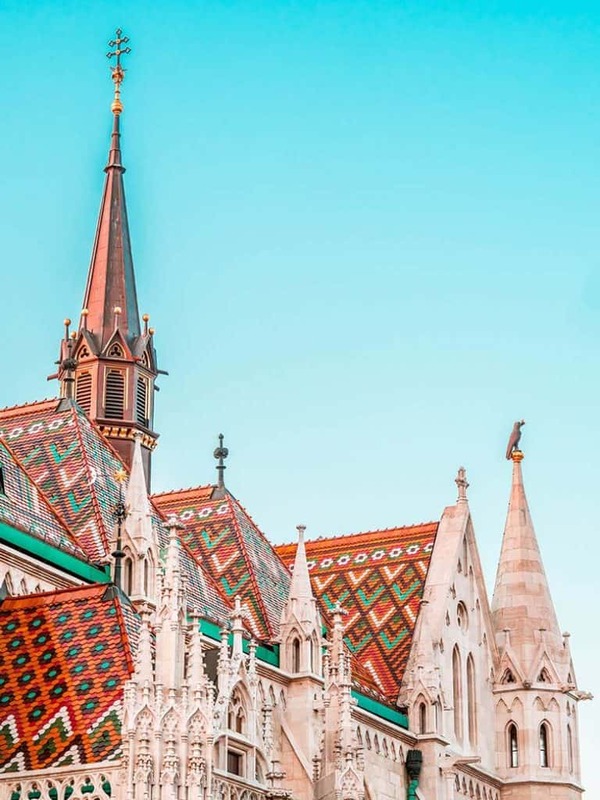 Right next to the bastion, you’ll also find the impressive Matthias’ Church with its high-detailed and stunning roof. If you read the summary I wrote at the beginning of this post, you know why this church is quite special. Well, if you didn’t, that’s okay (I’ll get over it). Namely, Emperor Franz Joseph I and the Empress Sissi of Austria were crowned here. Now you know. Castle Hill is filled with history. 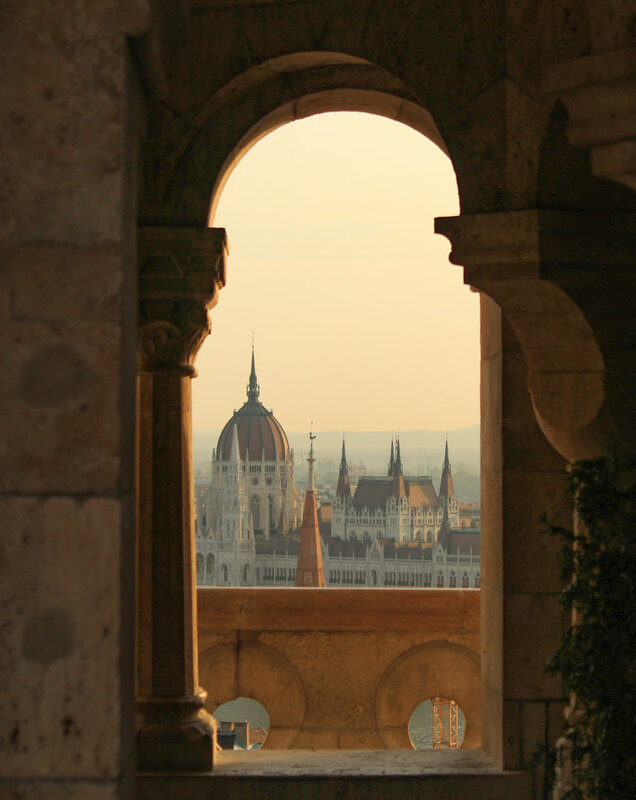 It has the Fisherman’s Bastion, Matthias’ Church, and the Buda Castle, which houses a few museums. 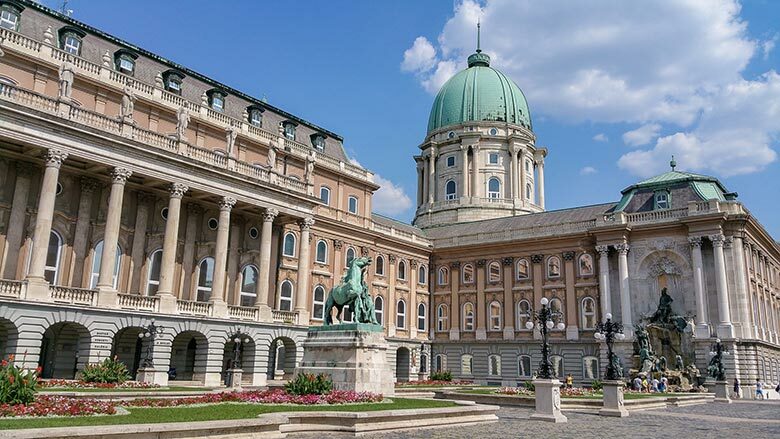 There are a few museums, but the most significant ones are the National Gallery and the Budapest History Museum (about HUF 1900 each). If you’re near the Chain Bridge, you can get the funicular to go uphill. It’ll spare you some time, but there are escalators and elevators around its the base of the construction. Know that this is a 15-minute walk from Matthias’ Church. Naturally, you can have many photos stops along the way, and mainly at the castle itself, you’ll have an excellent view of the Parliament building and the Chain Bridge together. Consider going on a boat tour so you can have a privileged view of these sights. The Gellért Hill is located in the southern part of Budapest, right in front of the Elisabeth Bridge. 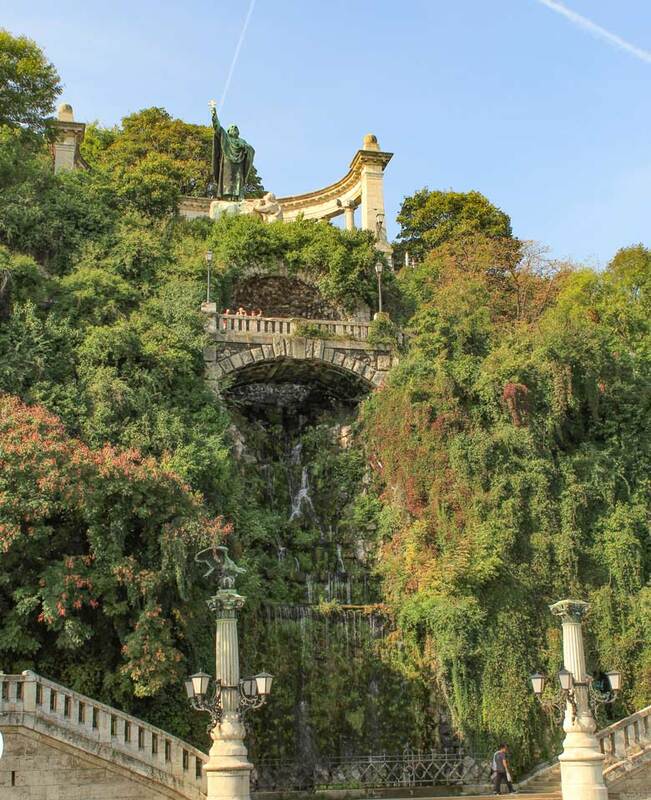 At the entrance of Gellért Hill, is a stunning waterfall full of plants in its extension. When we were here the sidewalk next to the stairs was an isolated crime scene. No idea what happened though. Fun fact: Gellért Hill is named after a missionary bishop, who was captured and rolled downhill in a barrel by pagan leaders. Quite a sad story, I know. The bishop’s citadel is atop the hill together with the imposing Liberty Statue that can be seen from many places throughout the city. The latter was built right after the Second World War by the Soviets to honor the memory of those who lost their lives for the prosperity and freedom of Hungary. Part of a UNESCO Heritage Site, the Citadel is a 19th-century fortification turned into a lookout tower by the Nazi and later by the Soviets. The entrance is free of charge, but there is a small charge for the WWII Museum/ Bunker. Oh, and if you get hungry, a cafe and a restaurant (evenings only) are available at the site. How to get to the Citadel? If you’re at the Buda Castle, walk downhill back to the Chain Bridge and take either the tram 19 or 41 towards the southern part of the city. And for your information, the way up, my friend, it is on you. Prepare for a 15-minute hike uphill. 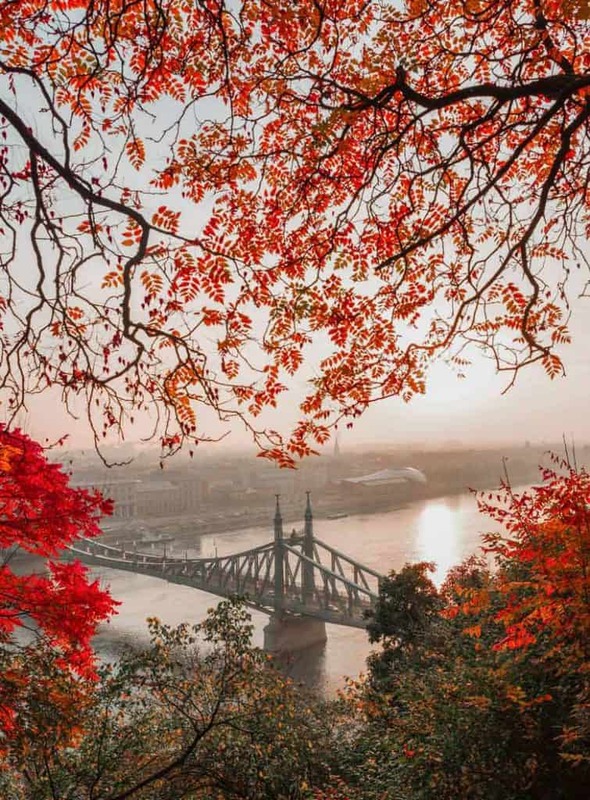 On the other hand, there’re many beautiful spots to take photos and see the city – the panoramic view of Budapest is breathtaking. At the other entrance of the hill, near the Gellért Thermal Bath (one of the best thermal baths in Budapest) is the Cave Church, a still functioning church into the cave system. A large cross marks its entrance. 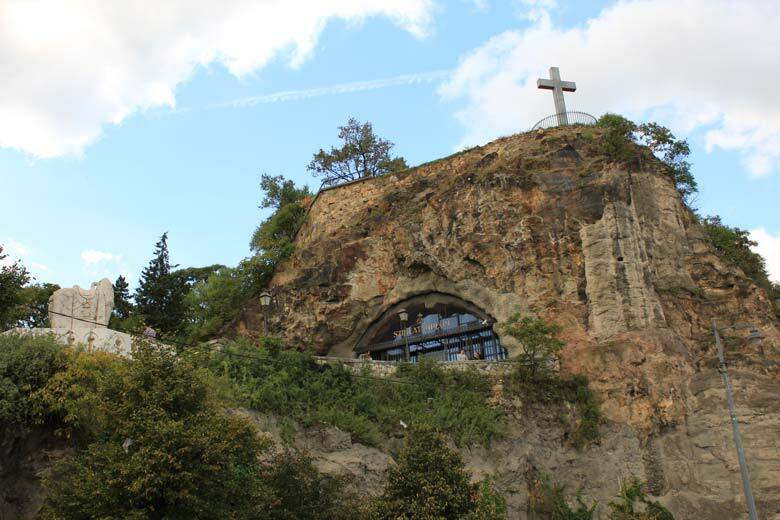 Cave Church – see the entrance? The pest side of the city is where you feel the underground vibes the city carries. Buda is more residential and Pest is more lively with nightclubs, ruin pubs, and social life. From Gellért Hill, cross the Liberty Bridge and you’ll see the Great Market Hall right away. 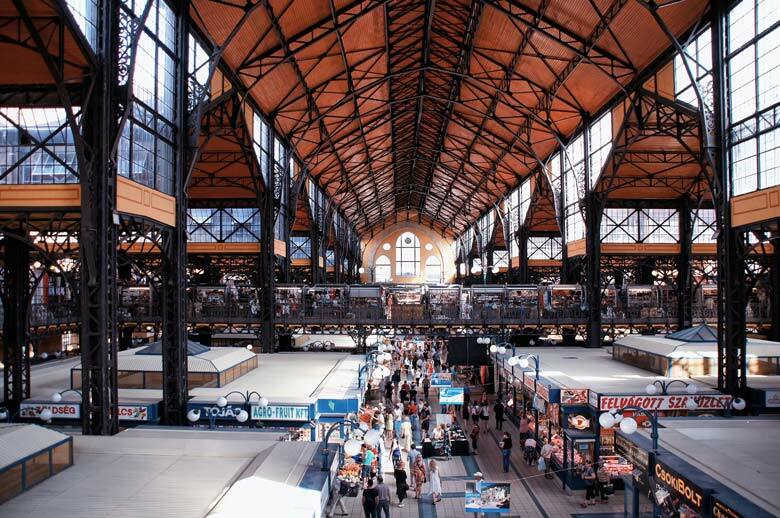 This market has a splendid architecture, really tasty Hungarian food, souvenirs stalls, and many shops to purchase gifts. It actually has a little of everything! Stroll along the main hall to find some seasonal herbs and exotic spices. A lot of locals do their everyday shopping here, so you can feel a little more of the Hungarian culture, but don’t expect it to be empty. In fact, it can be very crowded. We were there on Monday afternoon, and it was packed, but the food was smelling so freaking good! On top of that, the souvenirs weren’t as expensive as in the popular Váci Street. Right in front of the market starts the Váci Street, an old and fancy shopping street with very touristic shops. Also, it’s notorious for its expensive stores and restaurants. You can have a pleasant stroll here until the Vörösmarty tér station. 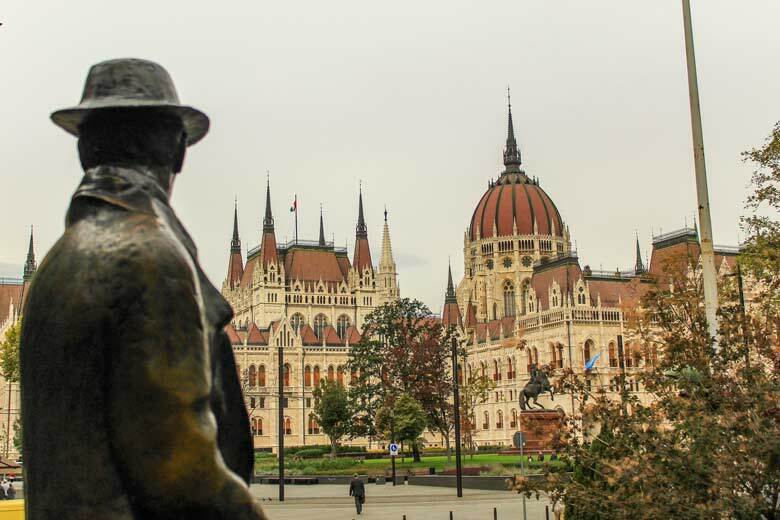 Start off your day by visiting the Imre Nagy statue staring at the parliament building, near the Kossuth Square. He was two times prime minister of Hungary, and the second time was during the Hungarian Revolution of 1956, which I mentioned in the “History” section. Those events lead to his death as his non-Soviet government was pulled down with the Revolution’s failure. He became a symbol of freedom, even though his name wasn’t allowed to be mentioned during the Communism in Hungary. On a side note, People often compare Vienna and Budapest because of its architectural similarities. They say Vienna is prettier, but I’d say Vienna had a less bloody past. Budapest was oppressed by communism – while Vienna wasn’t – and many buildings still carry the scars of that time. Like in the buildings across the parliament. The bullet holes on the walls are marked with iron balls. Remains of the Revolution of 1956. 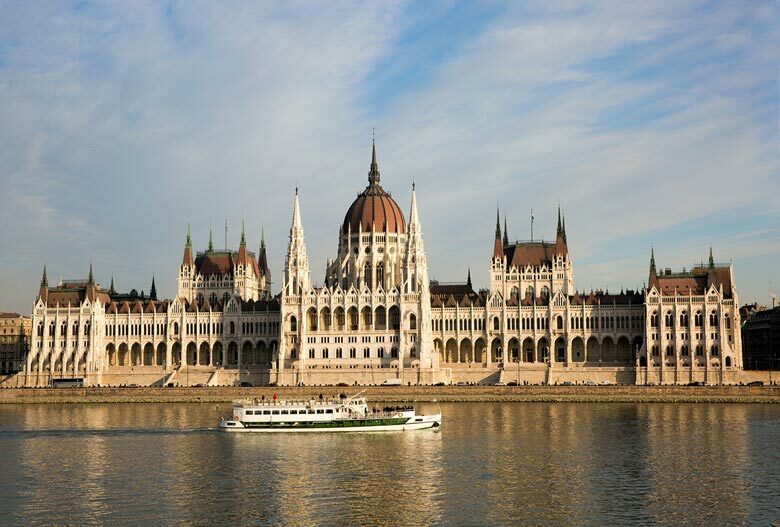 Perhaps the most famous parliament building in the world, this imposing Gothic/ Renaissance Revival-styled construction lies on the bank of the Danube River, and it’s impossible not to see it. It’s not only the tallest building in Budapest but also the largest in Hungary. The construction took 109 years to be completed, so trust me, it’s huge! You can take a guided tour of the parliament building and see its impressive interior yourself. Alternatively, you can have a beautiful view of it from a boat tour during the day or a boat tour in the evening. 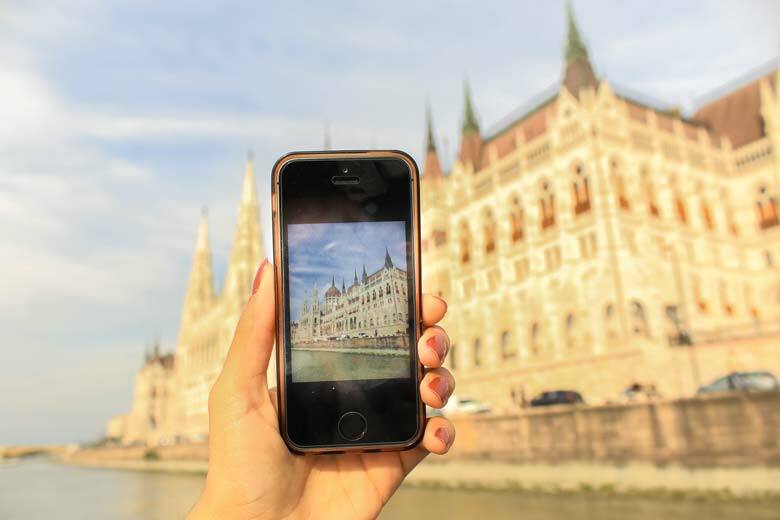 In both cases, you’ll have a spectacular view of Budapest! I suggest purchasing the City Card if you’re planning to visit some museums. This card offers access to public transport and discounts at the entrance price of many places, or even free access to them. How to get to the Parliament? The Kossuth Lajos ter Metro Station, line 2 red, is right next to it. 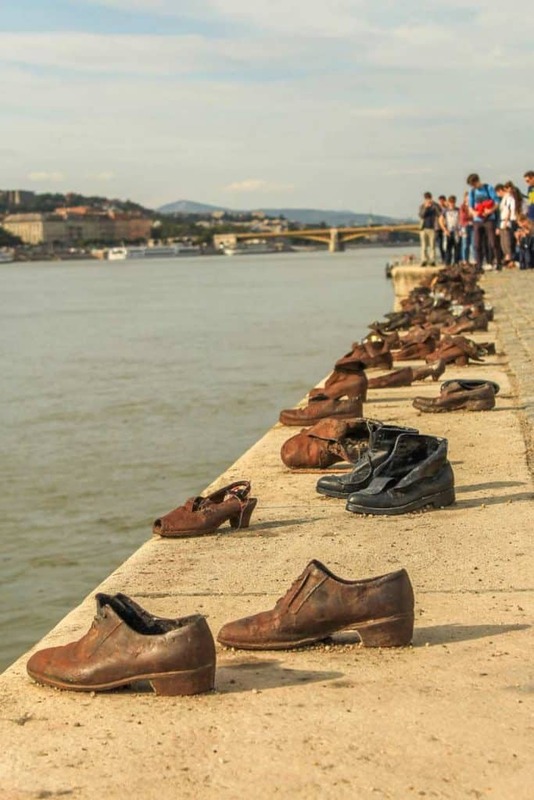 Perhaps one of the most moving places you’ll visit during your 3 days in Budapest, the Shoes on the Danube Bank is a heartbreaking WW2 monument. It honors all the people, including Jews, that were shot dead into the Danube River. They would be ordered to take off their shoes right at the edge and face the river. 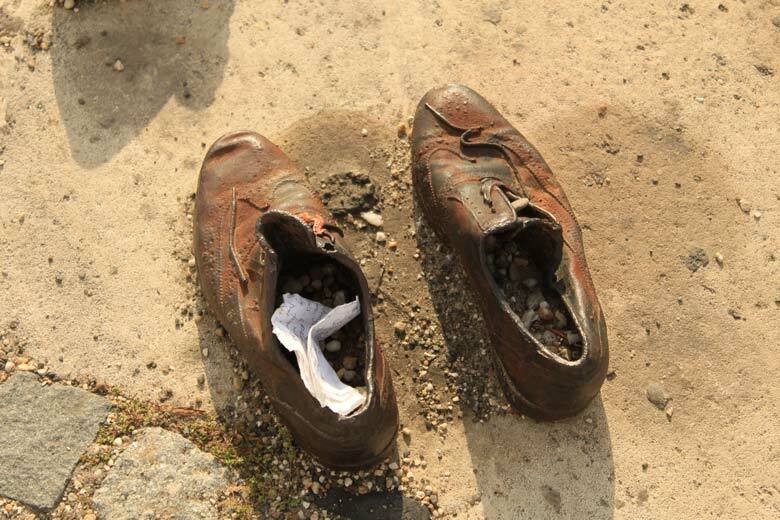 Then they were shot so the water could carry them away, leaving only their shoes behind. On a side note about dark tourism: As you’ve read, terrifying things happened here. People lost their lives in horrendous ways, and they would nothing but fear because they knew what was about to happen. So if you’re going to photograph the monument, be respectful. Don’t take selfies, funny photos, or any photo that includes modeling. This is not the place for it. 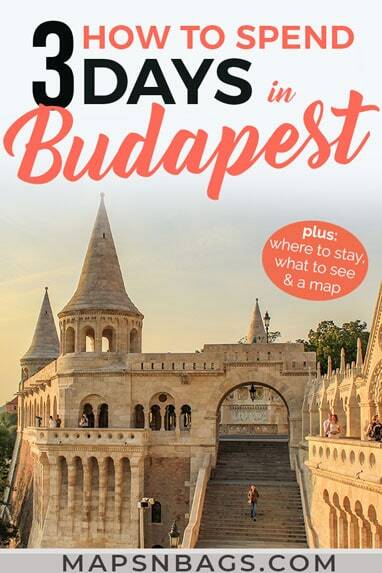 What to do in Budapest in 3 days? On the way to St Stephen’s Basilica, we stopped at a small Hungarian restaurant called Mean Joe. Obviously, we had to order the traditional Goulash soup. We love hot lunches. This soup is a delicious and simple stew of potatoes, carrots, tomatoes, bell peppers, and beef. Nom nom. It was so tasty! Not to mention that it wasn’t expensive at all. 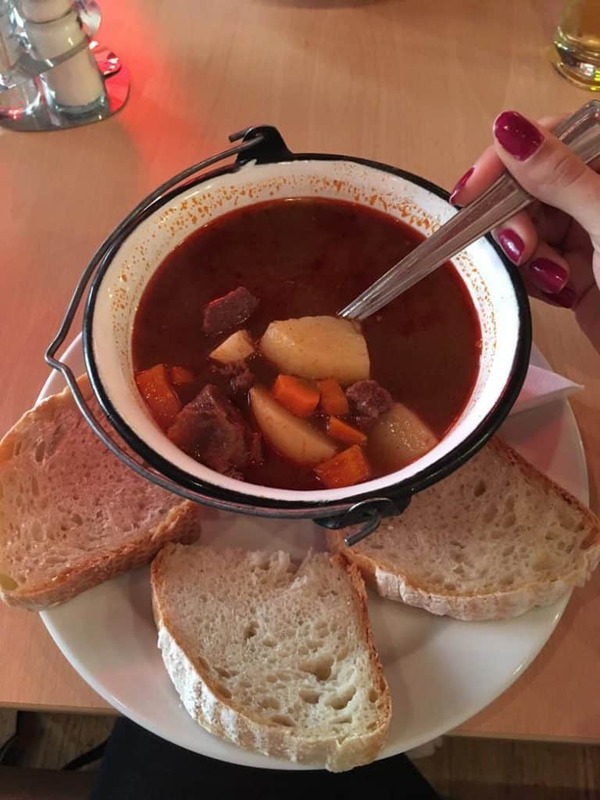 Two goulash soups with bread, three half-liter beers for HUF 6215 (around $24). 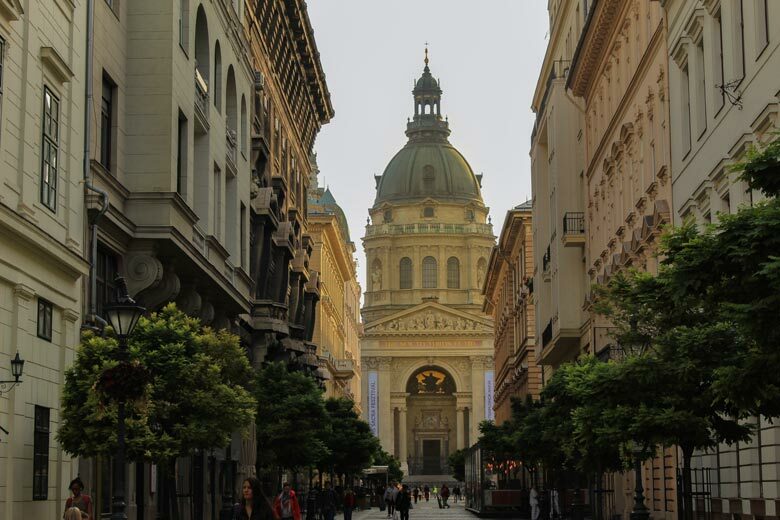 St Stephens Basilica – imposing, isn’t it? The St. Stephen’s Basilica is an impressive 315ft-tall (96m) neoclassical construction. 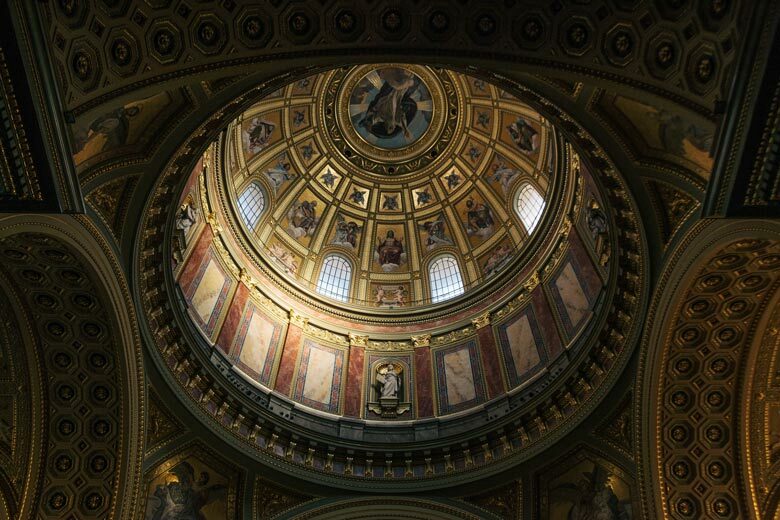 Named after the first king of Hungary, the third largest church in the country has free entrance, however, if you want to climb to the top of the dome (open from April through October), you must pay a small fee HUF 300 (around USD 1,15). Besides its beautiful architecture, the basilica is home to one of the most important Hungarian relics, the St Stephen’s mummified hand. The artifact is kept inside a reliquary on the right side of the basilica, to see it, you must put a HUF 200 coin into the slot to illuminate it. Fun fact: This is one of the 10 most photographed tourist attractions in the world. Europe’s largest synagogue fits 3,000 people and is located in the Jewish Quarter. There you’ll also the Jewish Museum. There are many excellent guided tours available in different languages, usually with a local who has a lot to share about his/her religion and family stories. And also has a lot to tell about why the synagogue is so important in Hungary and in the world. In the synagogue’s garden, you can see the Tree of Life, a WW2 monument that has the name of a victim on each of its leaves. It’s impressive for sure. Near the tree there is an inscription: “Whose pain can be greater than mine?”, and a brick from the ghetto with the word “Remember” on it. Needless to say how moving this place is. 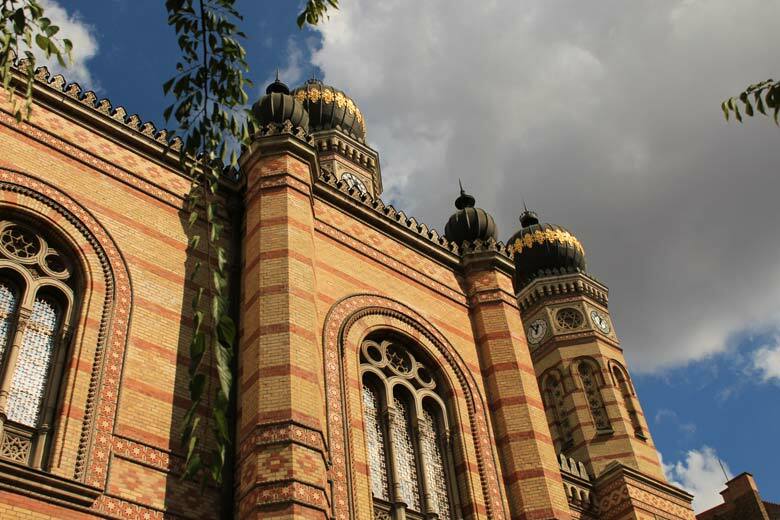 You can visit the synagogue and the museum in a 2-hour guided walking tour. The entrance fees are already included in this price. Budapest is a gorgeous city, but it has a dark past as you might have noticed. A few blocks away from where the ghetto was, lies the House of Terror. To get here, you can better take the metro, by the way. Get off at Vörösmarty utca station. So, the name of this museum is fair to the things that happened here. The building was used by the Arrow Cross, the Hungarian fascist organization, to hold political prisoners and host executions. Today, the sad and disturbing museum exhibits many reconstructed cells and rooms, lots of information about the Hungarian Nazis and the communism in the country. I’d recommend renting the headsets, there are really interesting information and stories to listen to here. Opening hours: daily (except Monday) from 10 am to 6 pm. Admission: HUF 3000 (around $10), but there are a few exemptions and discounts. Budapest’s most significant and most symbolic square celebrates the 1000 years of the Magyars’ history, the tribes that founded the city. Archangel Gabriel is atop a pillar while the seven tribes’ leaders and the Prince Árpád surround the place. 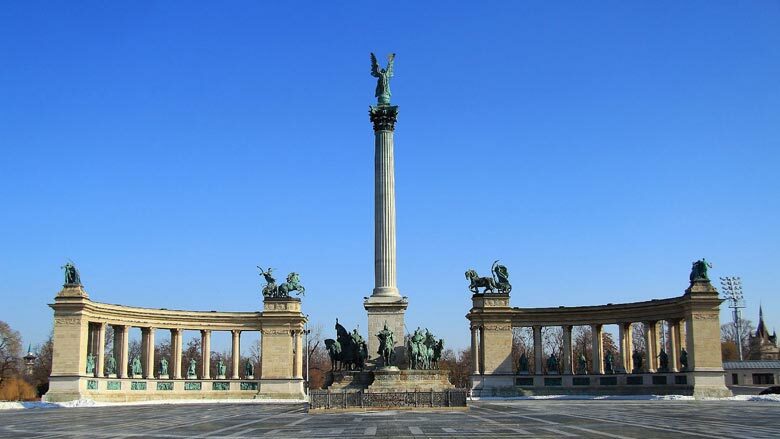 When the square was built, Hungary was still part of the Austro-Hungarian Empire, so the statues behind the pillar represent Kings, important historical figures of Hungary’s history, and also members of the Habsburg Dynasty. 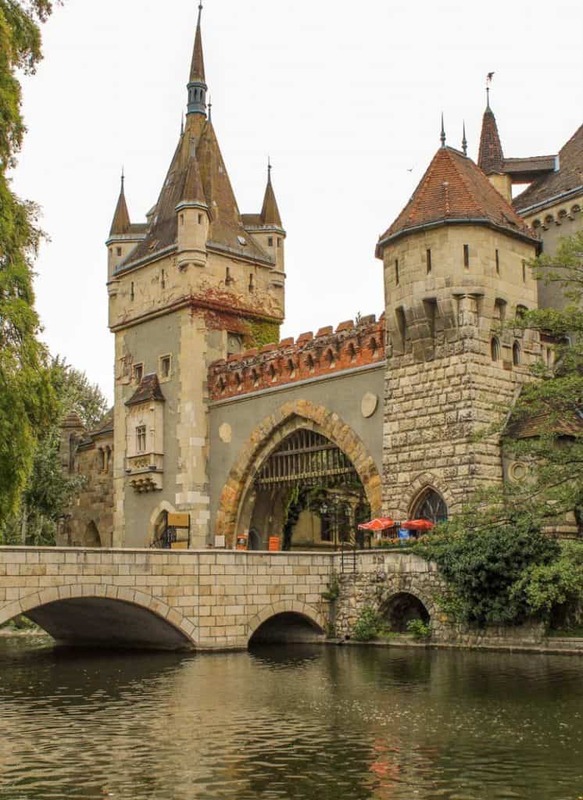 Head to the city park behind the square to see the gorgeous Vajdahunyad Castle. It’s inspired on a Transylvanian gothic castle, and it houses the Museum of Agriculture. Still in this park, you will find one of the best things Budapest has to offer: a thermal bath. Budapest is very famous for its thermal baths, a result of the Turkish occupation, and after 3 days in Budapest, which is not a small city, this is a really relaxing program. There are a few thermal baths in the city, and this one in the park is the biggest and the most traditional one. However, if you want to get to know the others better, check out this article we wrote on all you need to know about the thermal baths in Budapest. Kuplung ruin pub – cool place with delicious food! That was so so sooooo tasty! 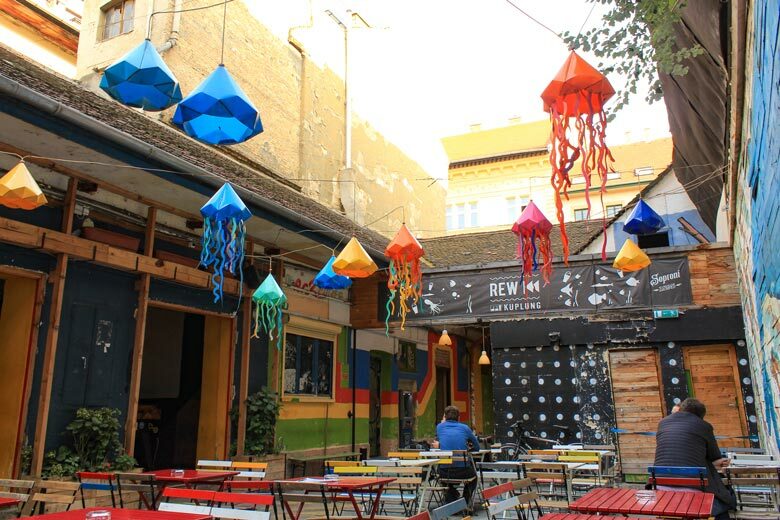 The popular ruin pubs are based in the Jewish Quarter, where all the Jews of Budapest were forced to relocate until the Nazis would decide to send them to a concentration camp. As you can imagine, a lot of buildings were abandoned when the war was over and their ruins were all that was left behind. Little by little, back in the 2000s, people started opening pubs in those ruins and courtyards. Now, more than 20 years later, the region is pulsing thanks to them: the famous ruin pubs of Budapest. Frank and I went to Kuplung, and I can’t stress enough how cool it was. The food was excellent and the beer was cold and decent. If you want to visit more than one pub, consider joining a pub crawl. They have top reviews. You’ll thank me later for that. If you have some time left and want to spend a day in another European capital you have two very interesting options. With a charming and vintage city center, Bratislava is a 2:40 train ride from Budapest. The return ticket costs around $23. If you’re wondering what is so interesting about the Slovakian capital, check out our one day in Bratislava guide. Imposing and the fanciest of these three cities (also the most expensive one), Vienna is also a 2:40 train ride from Budapest. A return ticket to the Austrian capital starts at $29. We spent 3 days in Vienna in this same vacation and you can find our complete guide here. Did you like this post about 3 days in Budapest? Then help us spread the word and pin it to your Pinterest board. 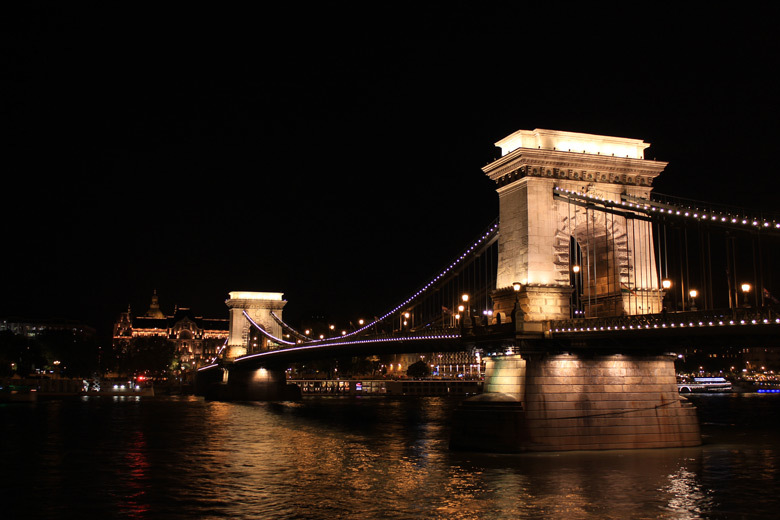 This entry was posted in Hungary and tagged Citytrip, Itinerary.